Think of the human voice in music. The most primal of instruments, it can melt you or move you to tears on the spot. Then it’s the saxophone, one-step removed from the human voice, and the next most powerful messenger in music. Johnny Hodges, Albert Ayler, Steve Lacy, Pharoah Sanders, Oliver Lake, King Curtis, Tim Berne, John Butcher - to name only a few of the many singular voices on the instrument who, with one short phrase or even one sound, can take your breath away, or excite and inspire you to great heights. 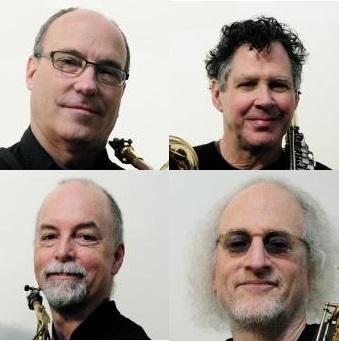 Multiply that power, that capability, times 4, and you have a saxophone quartet. Rova Sax Quartet: a group that can move you the way an Eastern European choir of voices can move you, but also a group with force, a force that can feel as if it's tearing the walls of the listening space down, or that can simulate the complex sound of a machine, or one of nature’s wild phenomena, or conversely, the almost-silent overlapping sound patterns heard with eyes closed in a field in the wilderness. With a 40th anniversary on Feb 4, 2018, Rova is one of the longest-standing groups in the music movement that has its roots in post-bop, free jazz, avant-rock, and 20th century new music; Rova draws inspiration from the visual arts, contemporary poetry, contemporary dance. We listen closely and deeply appreciate both the traditional and the pop music styles of Africa and Asia. And then there is the blues; always a key.